I can't tell you all how much I love to be back in good ol' Hanover County, Virginia. If you've never been, you should go. It's a beautiful small-ish town North of Richmond, Virginia. I've lived there my whole life up until 6 months ago when I got married. It's beautiful, clean, country and it's filled with some of the nicest people you've ever met. Although to clarify, I'm speaking of the western part of the county. No offense to the eastern side, I just prefer where I'm from and that it's still rural and less populated. Of all things recently I have wanted to go fishing so badly! Well this morning, my husband, father-in-law and brother-in-law hopped in their little boat and paddled around their pond and fished. I only caught one little sun fish! My husband was thrilled because he caught three more than me! The last few times we've gone fishing, I've been the one to catch the majority of the fish. Not only that, but I would catch them using a long stick that I had tied a line, bobber, and hook on! The morning on the pond was nice and relaxing, exactly what I wanted. Sorry I don't have any photographic proof of my little catch! Later on we went to my brother's house where they were having a housewarming party/going away party for him. Going away where, you say? On tour with his band for a couple months!! The band, is none of than GWAR! Many of you are probably saying, "Who in the world is GWAR?" GWAR is a heavy metal band based out of Richmond, Virginia. They've been around for over 20 years and are very popular in the heavy metal scene. Sadly, their lead singer/guitarist, Corey Smoot passed away last year and they chose MY BIG BROTHER to fill his spot! The music isn't my cup o' tea but I'm so proud of my brother to make it to the big leagues! Other members of GWAR came to the party so I got to meet them and hang out...pretty cool! 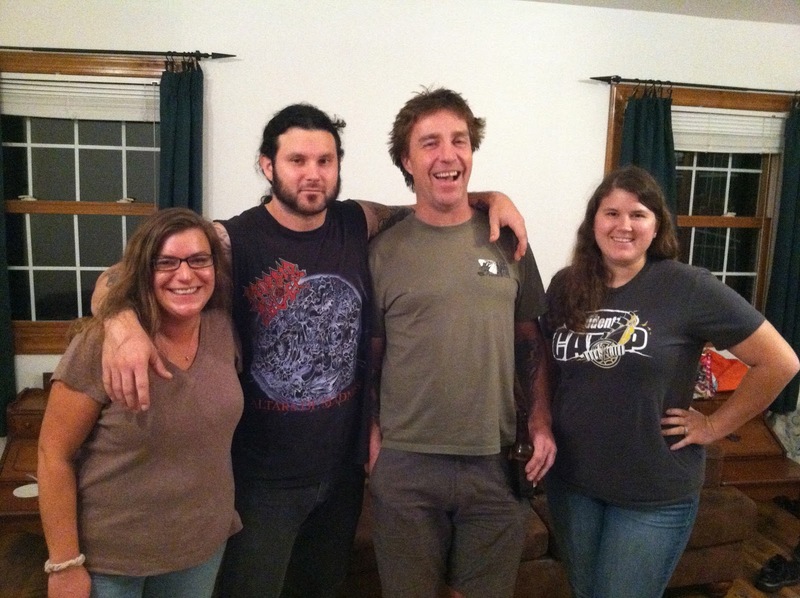 Here's my sister, my brother, Dave Brockie (Oderus Urungus) and me! We also went to a bonfire back at my in-laws and visited with lots of friends and family. All-in-all it was a fun night! Hopefully I can post some crazy photos from one of their shows at the end of the tour when they come back this way! Have you heard of GWAR? What do you think about heavy metal?